Ethel Beatrice North was born in a butcher’s shop in the East Midlands city of Leicester, England in 1890. She was the eldest child of Harry and Sarah North who had six children, all of them girls. Harry North was a butcher by trade and while waiting for his new butcher’s shop to open at 42 Hinckley Road in what is now known as the West End of Leicester, he plied his trade from just round the corner at his house on Ridley Street. It seems likely that as my grandmother’s parents (Henry and Louisa Warden) were living on Ridley Street at the same time, Ethel and my grandmother may have become friends as they played out on the street like most children did in the days when it was completely safe to do so. Their friendship lasted a lifetime. 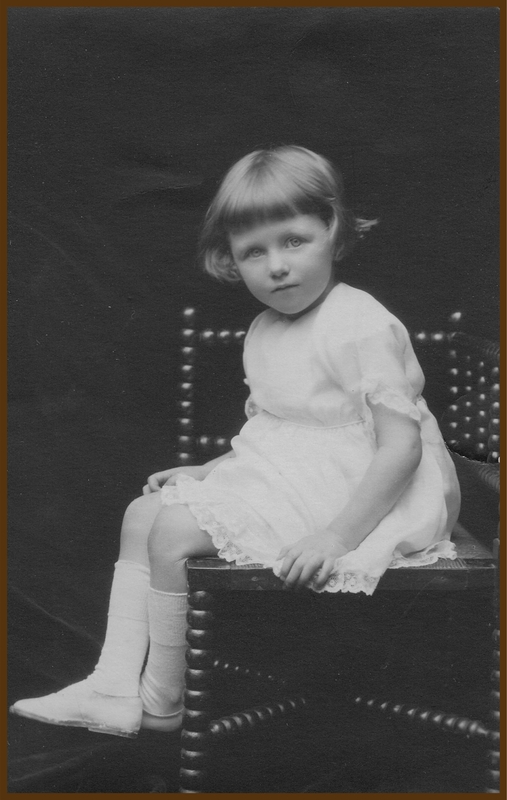 When my mother was born in 1922, she was given the names of Ethel Marjorie Merrall. Apparently she was named after Ethel North and always referred to her as “Auntie” Ethel, even though they were not in any way related. This seems to reinforce just how close my grandmother and Ethel North were. My mother always spoke very fondly of her honorary aunt and there was clearly a strong bond between them, although my mother refused to be called “Ethel” regarding it as far too old-fashioned and always went by her middle name of Marjorie. Most of the information I have about Ethel North comes from my mother’s recollections and it is patchy to say the least. Many years ago I asked my mother about her and was told that Ethel had trained as a dressmaker and appeared to be “a woman of interest and even mild intrigue”. Apparently there was talk of a broken engagement (Ethel never married) to a Swiss gentleman but according to my mother, the incident remained shrouded in mystery and even possible scandal. Since my mother passed away in 2010, I have discovered and met some of Ethel’s living relatives, namely her nephew and her great niece. (You can find out how it happened in this post on my writing blog called When Your Characters Come For Tea). Thanks to them, I now know that Ethel was always interested in travel. The letters written to my grandmother confirm that she had almost certainly travelled to Australia, India and Switzerland, even before she went to work for Lady Burghclere so she definitely seems to have been blessed with a spirit of adventure. I also found out that Ethel’s youngest sister Vivian North was a highly proficient swimmer who tragically died aged just 22 from what was probably meningitis. Strangely enough, although by then Ethel was writing regularly to my grandmother, there is no mention of this family tragedy in any of her letters. The first of Ethel’s letters to my grandmother was written the day after Peace Day (the Grand March of Allied Heroes through London) which took place on July 19 1919. 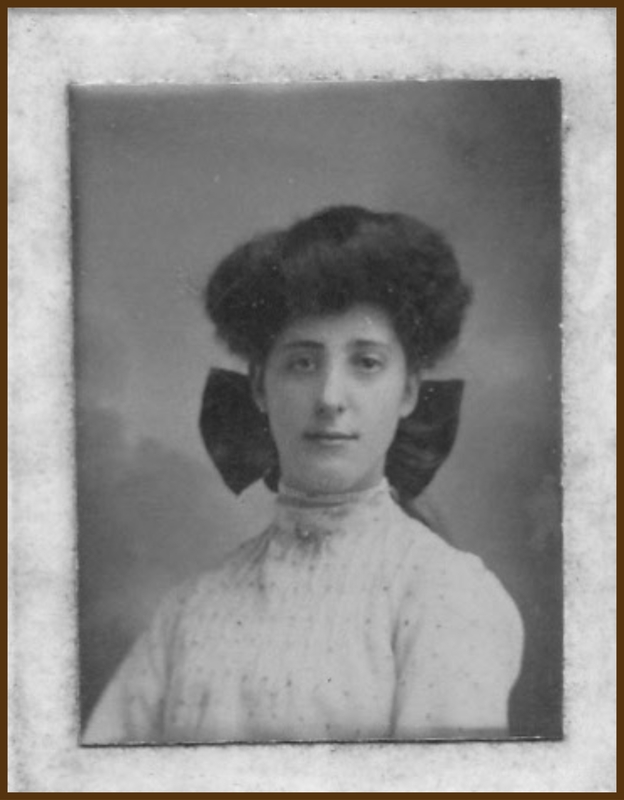 By now Ethel was working for Lady Burghclere and was aged 29. 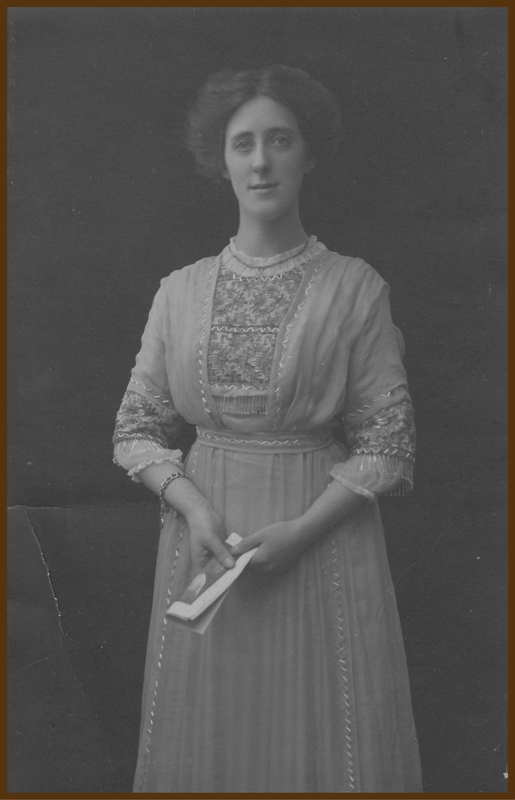 The first letter and my subsequent research indicates that she was appointed as Lady Burghclere’s lady’s maid, a position she may well have procured through both her dressmaking background (needlework skills were essential to the job) and her experience of travel. 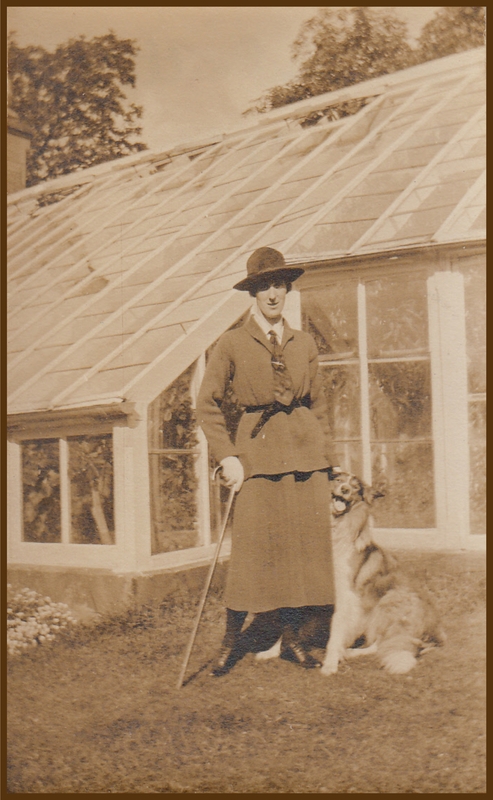 Like her brother, the 5th Earl of Carnarvon, Lady Burghclere didn’t seem to like staying in one place for very long and was a regular overseas traveller. Ethel and Lady B travelled to Egypt in 1928 on the S.S. Mooltan, a magnificent P.& O. liner. 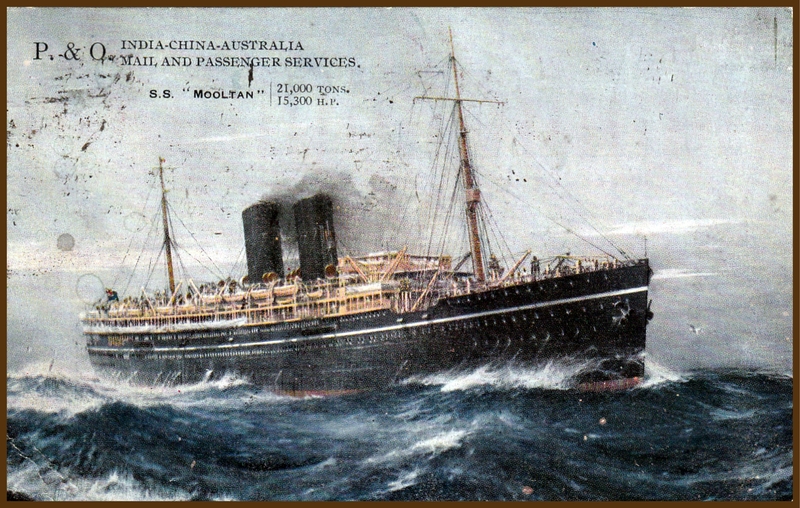 The crossing was apparently a lot calmer than it looks on this postcard she sent to my grandmother! As the personal servant of “milady”, Ethel would have occupied a high rung on the ladder of servants and this seems to be confirmed by the letters which barely mention her fraternising with any other servants at all. In fact towards the end of the letters, she complains to my grandmother that she is rarely out of Lady B’s company, they seem to spend practically every waking moment together. She also sometimes uses the royal “we”, such as when she confides in my grandmother that she is relieved that “we” had decided to invest in a smaller property when Lady Burghclere’s fortunes (like many of the aristocracy at that time) went into decline. Also, the way she talks about Lady Burghclere’s associates such as the diplomat Sir Esme Howard and the author Rudyard Kipling, as well as her close bond with Lady Burghclere’s young half-nephew Mervyn Herbert, indicate that Ethel was almost more “upstairs” than “downstairs”. My impression of Ethel from her letters to my grandmother is that she was something of a force to be reckoned with, although in a quiet and rather unassuming way. She was certainly not “backwards in coming forwards” as they say, having no qualms whatsoever in frequently offering her opinion on things that may not really have been her business! However, the great affection she had for both her mistress and for my grandmother and my grandmother’s family, as well as for her own, is very evident in the letters. She was clearly an extremely capable and proficient person but also a kind-hearted one. After leaving Lady Burghclere’s service, Ethel returned to Leicester and according to her nephew, devoted much of her life to looking after her elderly parents. She also found time to join the Red Cross in 1940 and was an “indefatigable worker” throughout the Second World War according to her obituary in the local paper. She was living with her sister Agnes at the family home in Leicester (coincidentally on the road next to where I now live) when she died from cancer in 1960, aged 70.